Another successful capstone project, EcoExplore is a flexible and scalable framework built to be a foundation for mobile applications that aim to engage members of the public in the exploration of the natural environments of New Zealand, and enable sharing of their discoveries. 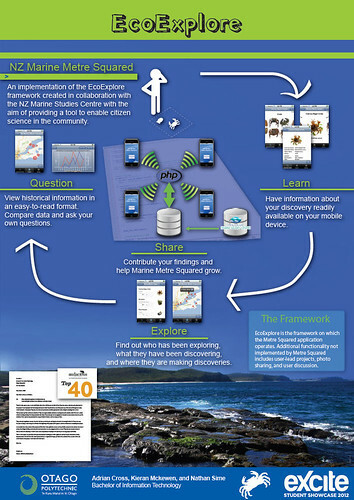 The NZ Marine Metre Squared application is an implementation of the EcoExplore framework we developed for the New Zealand Marine Studies Centre that enables members of the public to contribute organism population data, view trends in this data and overall learn more about the marine environment. Otago Polytechnic’s Bachelor of Information Technology capstone project sees groups of students undertaking real projects for real clients.